“Hanukah is… the Festival of Lights. Why is it near Christmas? These are all questions that have come up over and over with us and our kids. Sure, every year we light candles, eat latkes, give gifts, and tell the story of Hanukah. But what do we really know? And what’s the best way to teach those unknowns to our children so they “get it” and Hanukah doesn’t simply assimilate into Christmas? Innovative Jewish educators have hands-on activities to help get and keep kids focused and key into aspects of visual and tactile learning. 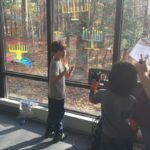 My own rabbi, Rabbi Ahuva Zaches of Congregation Or Ami in Richmond Virginia took a wall of windows in the synagogue’s sanctuary and used it as a transparent dry erase board. The kids were encouraged to draw their menorot. These are all types of visual storytelling. What about the adults? Chances are we aren’t going to make a dreidel, draw on the windows, or put on a Hanukah skit. Try sketchnotes and infographics. Using my iPad Pro, Apple Pencil, and the app @Procreate, I created this Hanukah sketchnote (of sketched infographic, if you are a sketchntoe purist). 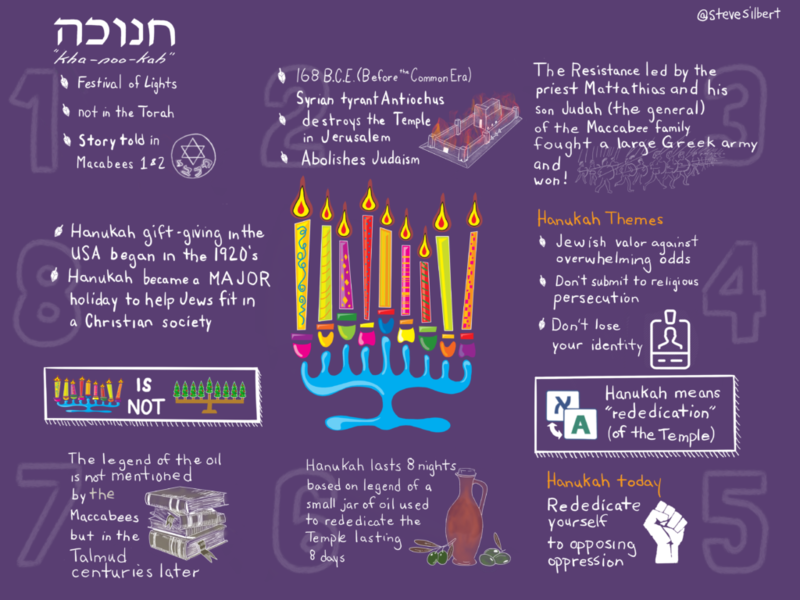 Starting with the URJ’s Hanukah History webpage, I consolidated the article into eight paragraphs, pulled out the interesting points in each, and added a connecting graphic. By adding large sketched numbers in the background helps the user follow the progression of ideas. All eight sections revolve around a whimsical menorah which I had originally obtained from shutterstock and subsequently redrew from scratch. The format is 12 in x 9 in and can easily print on an 18 in x 24 poster. I hear you. You’re saying “I can’t draw!” Yes you can. But if you aren’t ready to take that leap of faith, the entire thing can be created in Canva (www.canva.com), a top-notch graphics composition tool. Canva is easy to use and it’s free. Like any skill, it takes lots of practice and patience, but both methods can produce amazing results and a fun to do.